With correct instruction, it doesn’t take long to learn how to properly and safely operate a firearm. With good instruction, it doesn’t take much longer to start to develop marksmanship skills. However, when a target shooting athlete strives to raise their game and thrive under pressure, then things can get exciting! In our culture, we are taught to take control, make things happen, pay attention, try harder, and so forth. Each of those ideas has appropriate applicator. Even where appropriate, how the ideas are applied can be more important that what is done – that “how” can make all the difference. We are also taught to use our mind and directly apply it to our activities. In this teaching, we learn about and exercise only the “active thought” part of the mind. This is known variously as the “conscious” mind, or “thinking” mind, or “analytic” mind, or “slow” mind, or… more familiarly to our daily existence: the “talking” mind. This is the part of the mind we most often use when shooting; partly because this is the part of the mind we must use in order to learn anything, and partly because we are almost never taught that there is another – much more powerful – part of the mind. This other part of the mind is what I call the “deeper thought” part of the mind. It is often know as the “subconscious” mind or “intuitive” mind, or “quiet” mind, or “fast” mind. This is the part of the mind that learns deeper patterns, sequences, and timings. Unless you are learning to tie your shoes, the “deeper thought” part of the mind is generally doing the work. Last time you tied your shoes or boots, do you remember actually doing the activity? High level target shooting demands use of the deeper mind. We are culturally conditioned to not use that part of the mind, if we even realize it exists. The primary challenge we see with elite athletes, and improving athletes at all levels, is overcoming the cultural conditioning, learning about the deeper thought part of the mind, learning how to tap into its power, and trusting that manner of shooting. About 1-1/2 years or so prior to he 2000 Sydney Olympics, Nancy Johnson’s performances and especially her consistency seemed to dramatically improve. Why? One reason that she and her national team coach Dan Durben will point to is her hard work. Hard, hard work, year after year. She never gave up despite times of frustration and sometimes even feeling like quitting. There is no substitute for experience! Another reason that she spoke about seemed unusual to some listeners. She said she had to learn to “just be” in order to shoot well. “I lived for my yoga class!” she once remarked. Nancy had taught herself to tap into the power of the deeper thought part of the mind. Right after she graduated from college, where she was an All-American and NCAA rifle athlete, Kathy Vaughan started shooting and coaching with us in the Atlanta area. She now coaches a small group of pistol athletes, including her daughter, along with another coach, the father of another of the athletes in the group. There are three middle school girls shooting pistol, each shooting international standing position now for a year or less, and all are doing very well. Kathy’s daughter, Cheyenne, said she wanted to write a short essay about something she had learned. With her permission, and her mother’s permission, we share her essay with you. I grew up shooting air pistol. My mom, Kathy Vaughan, got me into shooting matches at the age of nine. I’m thirteen now, almost fourteen. This is an exciting year for me, going into my first year of the J2 age group. Shooting for about 5 years, I’ve learned that I can’t shoot well while I’m thinking. Last year with the help of one of my coaches, JP O’Connor, I figured out that if I empty out my head before shooting, I shoot better and group better. I try to empty my mind before a match, practice, and even dry-fire drills. I call this the Empty Method. After figuring out how to process this method, it took me about a month to empty everything out without trying. My scores have gone up and it’s also helped me with my school work. I don’t hear voices in my head telling me to do this, or don’t do that; it’s all peace and quiet. The empty method works on any kind of shooter, especially air pistol and air rifle, I have learned from experience. Almost every Tuesday night, at practice, JP comes to help coach. After shooting a target, or black card, we talk about our shots. When we first started this, my two team mates at the time, Katelyn Abeln and Nick McCoy, talked about their shots and how they felt when they released the trigger. It was my turn and I just sat there. I had to try and remember what I shot and how it felt, but really I didn’t know how they felt or what the trigger felt like when I released it. It wasn’t because I was stupid, it’s because I wasn’t thinking; my head was empty. Now, a year later, I’m able to shoot and remember a little bit about how it feels when shooting each shot. There are a number of profound topics lurking deep within in this short essay. I also like Cheyenne’s name for this style of performing: The Empty Method. The athlete must empty their mind of all the trash and chatter. One of the keys to attaining an empty or quiet mind is separating “outcome” (in all its forms!) from “doing” in the mind of the athlete. Our ego wants to win, get a high score, not be embarrassed, and so on. All are beyond the athlete’s direct control and all are in the future – or in the past and the athlete is still dwelling on the good or bad result. Even the last shot is in the past, and the score for this shot is still, ever so slightly, in the future. Which brings the next key to a quiet or empty mind. One must exist (“just be”) in the Present Moment without thought or care. One must learn to trust this method. When was the last time you tied your shoe or boot laces while worrying about whether or not you would mess it up? Don’t laugh; that’s what we do to ourselves in shooting, especially in a match! There are many additional factors, too numerous to list or discuss in one already too long blog posting. Notice how at one point, Cheyenne mentions that she cannot immediately recall and discuss what happened. “I had to try and remember what I shot and how it felt, but really I didn’t know how they felt or what the trigger felt like when I released it. It wasn’t because I was stupid, it’s because I wasn’t thinking; my head was empty.” This is very typical of deeper mind activity. Have you ever had little to say, or little to write in your journal right after shooting, but a few hours later you could talk or write all about what happened? The active thought part of the mind is the one doing the thinking and speaking or writing. The deeper thought part is the one doing the shooting in the Quiet Method so there is nothing for the active thought part to speak or write about. After things process for awhile, the information is available to the active thought part of the mind and we can discuss the events. As a high school student and then already an excellent shooting athlete, Jamie Beyerle Gray noticed this same effect. No doubt many of you have had the same experience. Keep your journal handy! Cheyenne may or may not yet be entering flow state (the so-called zone) at this point, though she is getting close, if not already there. We are patiently working the process. Her teammate, Katelyn Abeln is also working on this method and is now entering flow state at moments. We will have a lot more to say about flow state and choke proofing in future blogs. 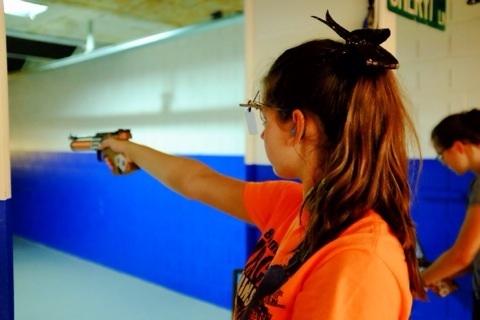 – Cheyenne Vaughan at Fort Benning competing in the 2014 PPP nationals. 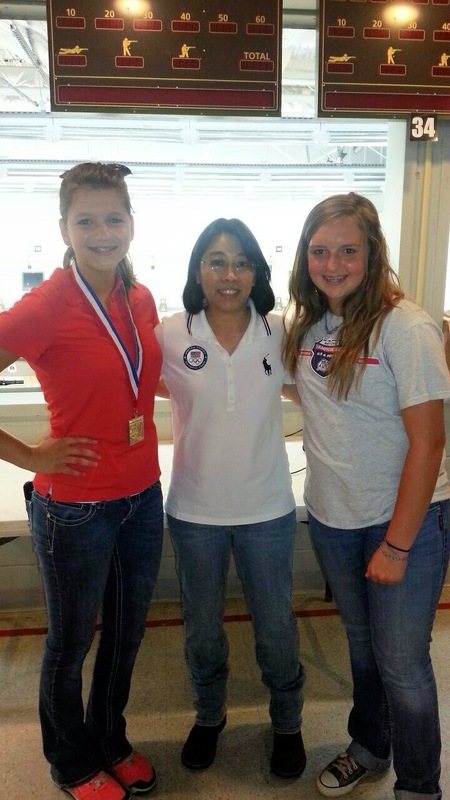 – Katelyn Abeln, Cheyenne Vaughan, and Sandra Uptagraff at the 2014 PPP nationals. Your comments and responses are always welcome. To be notified of new posts, go to the “Home” page and select the small blue “Follow…” link on the right side of the page just above the search box. On mobile devices, scroll way down near the bottom to find the “Follow…” link. How is your shooting going these days? Getting any better? Are your competition scores improving? Or are they stagnant? Are your competition scores a lot lower than your practice scores? Many athletes “try” hard to improve and certainly want to improve. Yet, their progress slows and they spend lots of time on a score plateau. Lots of practice seems to have little effect. There is a time and a place in your training program for “just shoot” without evaluation, judgement, or “fixing” of problems. This is how you should shoot in a competition. Yet, most practice sessions are constant evaluation, judgment, or “fixing” of problems. Remember, we will do what we are most used to doing when we are under pressure in competition. If we are constantly “fixing” things, we will find ourselves in that mode in a match. And our scores drop. One of the most important aspects of training is forcing ourselves out of our comfort zone. We only improve when we force ourselves (or our coaches force us) out of our comfort zone. Our sport is not about shooting at targets. No sport is about doing the actual sport. All sports, and indeed all performance activities (dance, singing, acting, public speaking, etc. ), are about learning to thrive and excel under pressure in the spotlight and in the heat of the moment. Sport is about learning about ourselves, growing, and learning how to compete well. We like to stay in our comfort zone. After all, it is comfortable! Outside that area, it is uncomfortable; who want’s that? However, staying in our comfort zone does not allow us to stretch or grow our capabilities. Intensity training – that is, training where the athlete cares about the outcome – is required in order to 1) learn how to thrive under pressure, 2) prevent choking, and 3) set the stage for entering flow state (the so-called “zone”). The more time an athlete spends in intensity training, the faster they learn to thrive and the more confident they become in their abilities. This allows them to trust their training and “just shoot” without control. The results are amazing. A little over a week ago, I ran an advanced weekend training camp for a group of pistol athletes. Their ages were 19, two were 16, two were 14, three were 13, and two were 12. 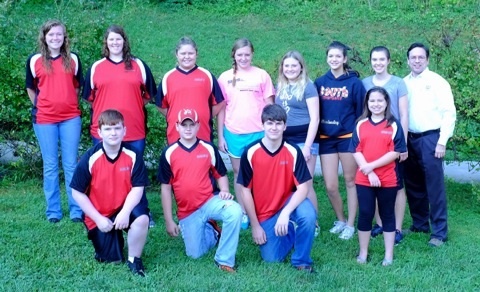 Their experience in target shooting ranged from a few months to a few years. 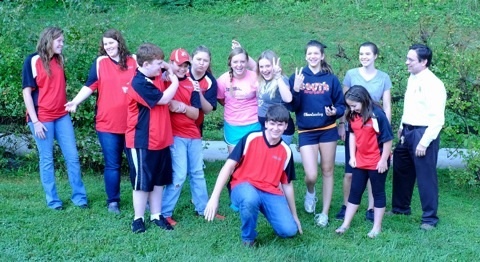 We had six athletes from the Blocton (AL) Bullets and four girls from Georgia, including three from the Paulding County team. Both are excellent programs with great coaches and very motivated athletes. We spent very little time in the mode to “tweak” or “fix” details about their position (angle to target, shoulder up or down, free arm position, etc. ), area of aim (center, six, thin white, down in the white), trigger technique (lots of variations possible, though only some are helpful), or other physical and technical aspects of their shooting, since they and their coaches can work on these items at their own training sessions. We did talk about a few concepts, but left it at that for this camp. Yes, those items are critical to success and there is a time and place to make adjustments. (But not constant tweaking and fixing. That destroys performance.) However, for this camp, we did not want to change the athletes’ setup, unless absolutely required, because we wanted them shooting the way they are currently familiar with. This is very important for what was to follow. Instead, we focused on the mental and emotional aspects of high performance under pressure. What holds us back from top scores? Once we handle the physical and technical topics (which is, paradoxically, where we spend most of our time and effort! ), the entire rest of the game is mental and emotional. It starts with ego. We want to be in control. We want to be inside our comfort zone. We want to “guarantee” the outcome. We want, we want, we want. And we look outside ourselves for the answers – and the excuses. The very best performances come from deep inside ourselves. They come to us when we “let go” of control, trust ourselves and our training, and allow the shot process – or the dance, or the song, or the acting – to unfold, seemingly on its own. How do we learn to do this? First, we must understand the concepts. Understanding the dynamic of outcome (results, score, place rank, not finishing last, looking good, not messing up, etc.) vs. doing (just doing the activity, experiencing the moment, etc.) is the single most critical element in learning how to thrive and excel under pressure. Make the move about the move, not about the outcome. Make the shot about just doing the shot, not about the outcome – or about the last outcome. Not controlling the shot; just doing the shot. Outcome, in its many forms, is in the past and the future. We have no control over the past and future! None! That’s right, it is critical to understand that we have no DIRECT control over our own score! We wish we did! If someone claims otherwise, ask them why they don’t shoot perfect scores. Is it because they are lazy or incompetent? Of course not! We do NOT have direct control of the outcome. We just wish we did. The only thing we can control is ourselves. What we do, what we think, how we approach the doing. When we learn to manage ourselves properly – that is, in a manner that is conducive to top performance – then the desired outcome is much more likely. When we focus on the outcome itself, or control the doing, the desired outcome is much more unlikely. Yes, it is a paradox. Overcoming that seemingly “illogical” concept is paramount. Funny thing is, once it is understood, it is perfectly logical! We have been training our deeper mind to shoot. We just don’t realize that. Have you ever had the gun come down on target, arrive on the area of aim and instantly the shot is released, seemingly by itself, and get a really deep 10? And you were surprised or scared because you were not ready? The surprise is because the active thought part of the mind was distracted allowing the deeper part to shoot. The active part of the mind, and our visual system, are too slow for this sport, as they are for many other activities. The deeper mind, when trained and then ALLOWED to just “run the program” without interference, can produce stunningly good results on an otherwise unbelievably consistent basis. Second, we must spend time in training to experience different modes and then do a lot of intensity training. Forget about the comfort zone! After an initial discussion, we started the camp’s shooting activities with some shooting on black paper. (For air pistol, we use 9×12 inch black construction paper.) The athletes were not used to this “target” so they were introduced to shooting with no aiming reference and no outcome. Disoriented at first, they soon discovered that they could “let go” and “just shoot” each shot. Thus, they could experience the “mysterious” mode of letting go and just shooting the shot that we so often hear about yet do not fully grasp. Experiential learning is the best form of learning, so we like to do training exercises that maximize the experiential aspect of learning. The idea is to set up a properly optimized combination of position, balance, and natural point of aim. Then trust and recreate that feel for each shot. In essence, one’s body becomes the sights. This is very disorienting at first, and eventually the ego has to “let go” of attempted control. And the athlete shoots freely. 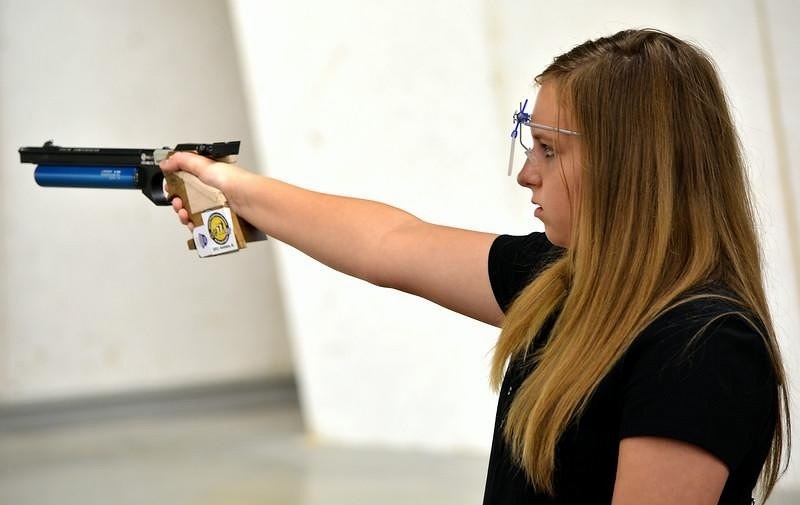 One of the 13 year old athletes, when first introduced to the black card several months ago at the age of 12, at that time described the feeling as “unconstrained” shooting. Then we did some “traditional” shooting to let them feel comfortable about their baseline shooting. They were reminded of the “black card feel” and encouraged to dare to “let go” of their desire to control the shot and instead allow it to unfold. Shooting without “taking control” did get them a bit out of their comfort zone, but not very much. That was fine since this was a warm-up for what was to follow. Then the real “fun” can begin! We use many different intensity drills or games. Some coaches and athletes see or hear of us doing these “games” and dismiss them as frivolous. Yet they are the key to high performance. With a group of athletes of varying skill and experience levels, we chose to use a modified version of a classic drill called “First to Five Tens” which is a race to see who can be first get five shots that score 10 points. Go too slowly, in order to control the outcome or make it perfect, and you lose. Go too quickly, thus shooting sloppily, and you lose. The athlete must go quickly, with trust and no “controlling” of the shot, in order to win. This favors athletes who have a robust shot process, who trust it, and who allow it to run without interference or checking. To run the drill, after a prep and sighting period, athletes are instructed to load, have guns down, and then “Go!” on command. After that, they shoot at their own pace. Each time they shoot a shot resulting in 10 points, they loudly call out how many tens they have: “One!” and so forth. It is interesting to see someone get all the way to “Four!” and then lose to someone who later catches them because they couldn’t get that fifth 10 point result. We ran this drill for four hours! Not continuously, of course; rest breaks are critical for health, injury prevention, and to allow mental recovery so they are fresh and “hungry” to go again. All afternoon the kids, including the youngest ones, asked “Can we do it again?” So we did! With such a long dose of intensity, the athletes felt all the usual competition emotions. Joy, sadness, elation, despair, frustration, you name it. Emotions ran high at times. We validated the normalcy of those emotions under pressure and explained how to work through the feelings. They really challenged themselves and kept coming back for more. As we kept going, the athletes improved. They realized they could shoot well when they found an optimal rhythm (not too slow and controlling, not too fast and sloppy), gave up the perceived “control” they craved, and just shot. They were able to do this because their deeper mind was completely familiar with everything (position, balance, grip, trigger, sights, process, etc.) and the athletes could take advantage of that deeper knowledge, which they had not previously understood. Note that if we had changed many of these variables, the deeper familiarity would have been upset and they would not have been able to benefit from the intensity training until several training sessions later. On that same note, two of the more experienced athletes, including a medalist from the recent PPP national championship, decided to have a one-on-one challenge. They raised their lower limit to 10.4 in order to count. It took them awhile, but they got their five count! Another famous intensity drill is called 5 and 0 or 3 and 0. This is a pairs game for two evenly matched athletes. The score starts tied at 0-0 and someone is always at 0. After prep and sighters, the two athletes each shoot a shot. Whoever earns the higher score wins the shot and gets a point. (You can score by whole numbers, or by tenths if on electronic targets. You can also set a rule that in order to count at all, the shot must be at least a certain value.) The score is now 1-0. They each shoot again. If the person with the lead again earns the higher score on that shot, the game score now goes to 2-0. Conversely if the person in the lead has the lower score on the second shot, they lose their point and the game score goes back to 0-0. Remember, someone must always be at zero! First one to reach 5 (or 3) wins. When Jamie (Beyerle) Gray and Matt Emmons were in college, they would play this game together. Frequently. Sometimes, they would have to interrupt one game – which had already been going on for 2 or 3 hours – to go have dinner, and then come back to finish. That is how evenly matched they were. Imagine that: hours of intensity training where EVERY shot counts in a big way. This is just one of the many reasons those two are such great competitors. This is training – not practice. Games like these almost make competitions sound easy. Almost. When the younger and/or less experienced athletes saw that we believed they could shoot well, and that we believed they were already good shooting athletes, they rose quite a bit. It has been proven that individuals and groups often can and will rise to the levels expected of them, as long as the expectations are fairly realistic and if the athletes know it is OK to make mistakes. We encourage all athletes, regardless of level, to think of themselves as better than they think they currently are and to believe that they will improve. After all, that is where they are striving to be, and we want them looking in that direction. Throughout the entire weekend, we alternated between active shooting and round-table discussion. I asked lots of questions to get the athletes thinking and sharing experiences. Again, this maximizes their learning. Explain, experience, reflect together and share. It is a powerful teaching/learning methodology. It doesn’t matter what the coaches know; it matters what the athlete learns, experiences, understands, and internalizes. Teenagers, even young middle school athletes, when treated as young adults, when effectively trained, and when positively inspired, are capable of far more then they and many adults think possible. As coaches and parents, we must be careful to be sure expectations are set appropriately, not too high or too low, be realistic, make the learning and sport about the journey of learning and self-discovery, not about the outcome, demonstrate that mistakes are a positive part of the learning experience, not bad things to be avoided, and keep the atmosphere positive, supportive, and friendly. Then step back and prepare to be amazed! Below: OK, now to blow off a little steam. They have earned it!